Our third and final blog post on Peru’s eleven UNESCO World Heritage sites includes these last five UNESCO Archaeological highlights. These are all places of great cultural importance in Peru. Amazing archaeological ruins displaying incredible structures built by civilizations in Peru’s ancient history. Number one on this list is of course the famous Machu Picchu, but there are other lesser-known sites throughout Peru, many of which are just as impressive. The ancient ruins of the Inca citadel of Machu Picchuwere added to the World Heritage list in 1983. Machu Picchu dates back to AD 1438 and is regarded as the finest archaeological site left behind by the Inca Empire. 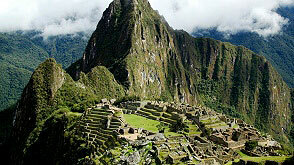 The purpose of the site is unknown, and Machu Picchu is steeped in much mystery and folklore. The giant stone walls and terraces compliment the beautiful natural setting of the Andes Mountains, as well as the deep valleys and thick jungles that surround the area. Machu Picchu is a remarkable example of man’s interaction with the natural environment. The archaeological site of Chavin is one of the oldest pre-Columbian sites in Peru, dating back to the Chavin people of 1500-300 BC. Found in a high valley within the Andes Mountains, Chavin is thought to have been a place of worship and consists of a series of terraces, squares, and other stone ruins. Since its inscription onto the UNESCO World Heritage List in 1988, Chavin has suffered an earthquake and a mud-slide, which covered and damaged some of the monuments. UNESCO and the Peruvian government have since worked together in recovering parts of the site. Unique and characteristic of Chavin are the many animal figures found on slabs, columns and walls throughout the site. These include jaguars, condors and snakes, and some human faces also peer out of the walls. The mysterious desert lines left by the Nazca people between 500 BC- 500 AD are found in the Peruvian desert south of Lima. These lines are among the world’s greatest enigmas and the 450 km2 stretch of land where they are found has been protected by UNESCO since 1994. 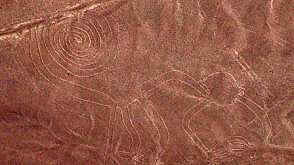 The lines are thought to have ritualistic or astronomical functions and depict animals, mythical creatures, plants and trees. The Nazca Lines, scratched into the desert floor hold much artistic and cultural value, and they are an important part of Peru’s history. The latest addition to Peru’s UNESCO World Heritage List is the sacred city of Caral-Supe, added in 2009. The site is over 5000 years old and is the oldest center of civilization in the Americas. Found in the desert in the Supe Valley, Caral holds an outstanding universal value as it is proof of a fully functioning civilization, with a clear hierarchy structure and signs of ceremonial areas pertaining to a strong religious ideology. Its architecture dates to the late archaic period and consists of monumental earthen platform mounds and sunken circular courts. The site has remained quite intact due to its early abandonment and late discovery. Chan Chan is an ancient citadel dating back to the Chimu kingdom of the 15th century, and was added to the UNESCO World Heritage list in 1986. The area was abandoned by the Chimu people as the Inca Empire began to dominate in the late 15th century, and the site is considered important in showing another side to Peru’s rich history. The site is in constant archeological exploration as the material from which the ancient structures are made is particularly delicate and vulnerable to erosion. 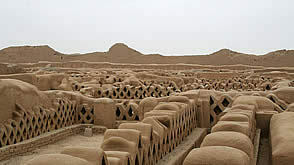 However, UNESCO aims to protect these crumbling ruins which form the largest adobe city in the world. The citadel has a surprisingly large and well-organized infrastructure consisting of palaces, temples, dwellings, storehouses, kitchens, reservoirs, orchards, gardens, funeral platforms, and cemeteries.